This weekend we come together for one big tribute to mom and there’s no better way to let mom know you love her than by giving her a bunch of booze and spending some quality time with her. We’ve managed to turn every other holiday into a drinking extravaganza, so why should we leave mom out of the fun? After all, she did birth us right? Just in time, we received a few awesome cocktail recipes courtesy of SkinnyGirl Cocktails and wanted to share them with our fans. If you make mommy a drink she’ll love you, if you make her a drink that still helps her keep her figure she’ll love you FOREVER. For those of you a bit unfamiliar with the Skinny Girl Brand, they’re the low calorie cocktail kingpins that started out from an idea for a healthier margarita from author, chef, and reality TV star Bethenny Frankel. Ironically enough, one of the first articles we wrote here at 101 was on the Skinny Girl, before they exploded into the brand featuring 16 different “skinny drinks” that they are now. To be honest, our philosophy has always been to make things fresh and from scratch, and with Mrs. Frankel being a chef herself, I’m sure she would agree. But not everyone can get as artisitic in the kitchen (or bar) as some of us, nor find all the right ingredients. Sometimes it’s just a matter of time and convenience. For those situations, read-to-drink or “pre made” cocktails are always an option. But be weary, the pre made stuff usually is LOADED with calories, even more so than the fancy colorful drinks you order at the bar. So knowing that you can take a short cut in your boozing and not worry about tipping the scales the next morning makes Skinny Girl a Plus. So if you haven’t already made plans, pick up a bottle or two of Skinny Girl and try one of these cocktail suggestions with mom this weekend. 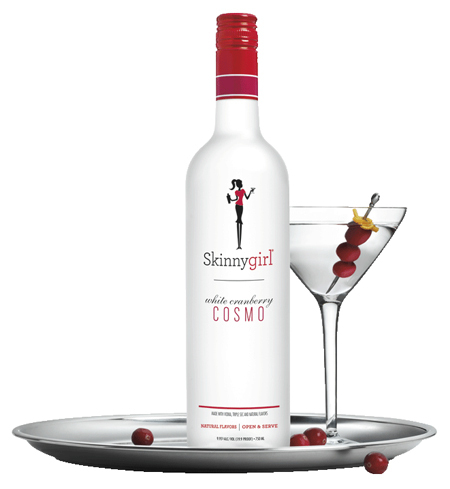 Mix Skinnygirl™ White Cranberry Cosmo and ice in shaker glass. Strain and pour into a martini glass. Garnish with frozen cranberries and enjoy! Salt the rim of margarita glass. Pour Skinnygirl™ Margarita over ice. Add muddled jalapenos. Garnish with lime wedge and enjoy!